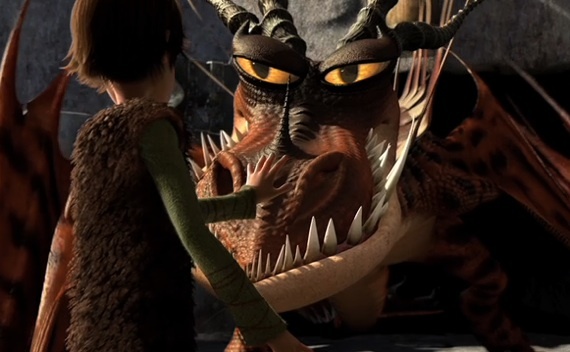 "How to Train Your Dragon" (2010) works on several levels. It is funny, emotional, and full of action. 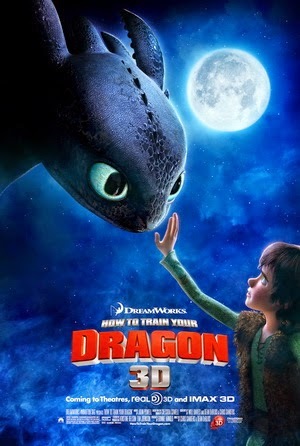 Dreamworks Animation hit a home run with this computer-animated film, equalling the best of Pixar of recent years. it was nominated for two Academy Awards, for Best Achievement in Music Written for a Motion Picture, and for Best Animated Feature. 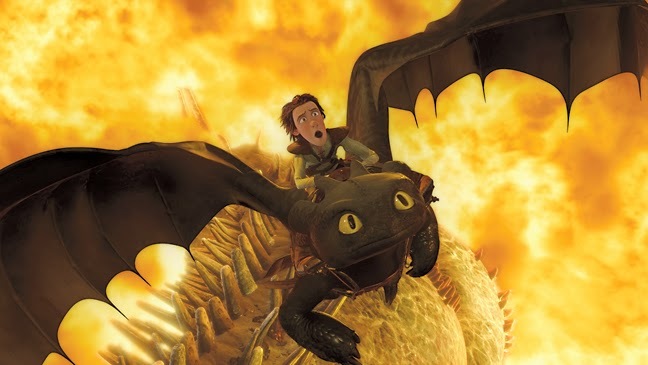 A small, awkward and clumsy young Viking living on the island of Berk, Hiccup Horrendous Haddock III (Jay Baruchel), watches his town being attacked by flying dragons and wants to help out. However, his father, Stoick the Vast (Gerard Butler), who runs the town, is afraid that he will get hurt, and will not permit his son to risk his life in battle. Hiccup wants to help anyway. He is clever, so he invents a device that will capture one of the dragons. He manages to get a mysterious Night Fury dragon, and is ready to kill it to prove himself to his father. However, he can't bring himself to do it. 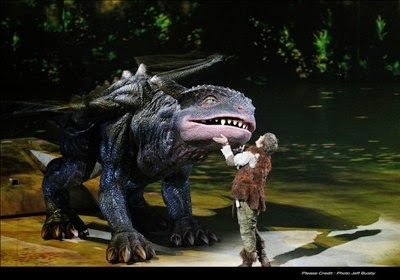 Instead, he starts talking to the creature, who he dubs "Toothless." 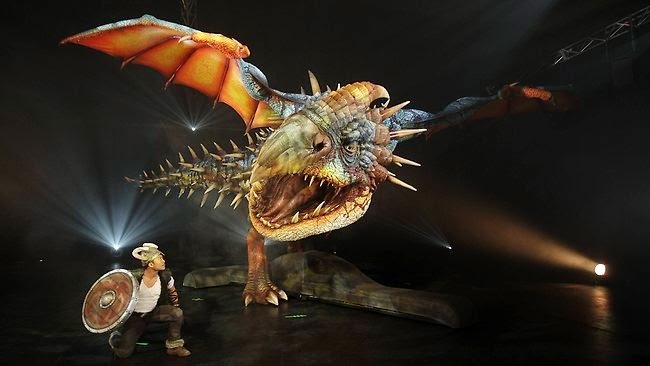 The dragons are not voiced by people - instead, their voices are created using sounds of various animals. 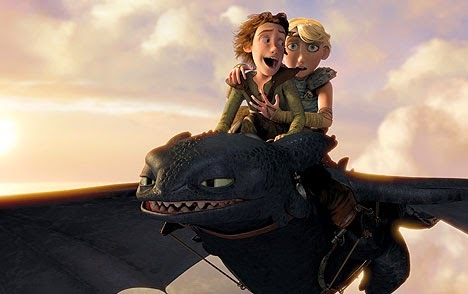 They become friends, and Hiccup learns a great deal about the dragons. It turns out that the war between the Vikings and the dragons may not be necessary at all. He is surprised to learn the real motivations of the dragons. Convincing the townspeople, especially his father, to make love and not war will prove to be very difficult. There is unavoidable violence in this film, but it should not be too much for even younger children to handle. It is in Technicolor 3D, which adds to the flying sequences and is relatively unobtrusive. The pacing by directors Dean DeBlois and Chris Sanders keeps things moving along nicely. Unlike so many animated films these days, the voice actors are not such huge celebrities as to call attention to themselves (Craig Ferguson plays the village blacksmith, and he has the only recognizable voice in the cast besides Butler). This allows you to focus on the story and the characters, rather than whether, say, Jennifer Aniston or George Clooney are making some kind of inside joke about themselves. The story is king in this film, along with the quality of the animation, and both are superior. Cressida Cowell wrote the book on which the film is based and approved the changes made for the film. There is commentary about the meaning of courage, friendship, love, prejudices, war and many other things, presented in such a way as to make you think. Of course, everything is simplified to fairly simple messages with straightforward conclusions, but it works in the context of this film. You will come for the terrific action sequences, and leave satisfied by the humor and the story. Very entertaining for viewers of all ages, so if you get it for your child, you may wind up watching it yourself just for fun. A sequel is set for release in 2014. 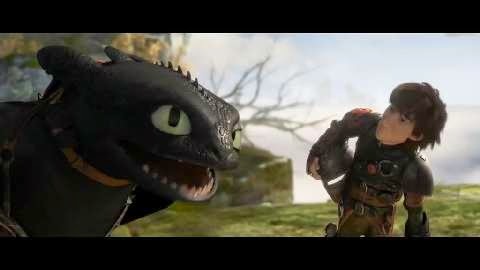 Below is the trailer for "How to Train Your Dragon."